You maybe have collected plenty of 3D movies, no matter they are offered by your friends, or downloaded from sharing sites like YouTube If you do have these collection and want to watch these 3D movies on Samsung Gear VR with Galaxy Note 5, Galaxy S8/S8+, Galaxy S7/S7 Edge and Galaxy S6/S6 Edge/S6 Edge+, here are the steps to teach you how to transfer 3D movies to Gear VR. You have a Blu-ray Ripper which has the power to deal with Blu-ray/DVD, 4K/SD/HD videos you have. Note: Here, I choose to use aPubsoft Blu-ray Ripper, which can rip all the newest even region-locked Blu-ray/DVD and work in 4K/SD/HD video, TV shows and music dramas. It can accept H.265, MP4, AVI, FLV, MKV, ASF, etc and then change them to 3D SBS MP4/MKV/MOV for Gear VR. For me, it is the best choice. If you still don’t have one Blu-ray Ripper, you can try it. Insert 3D/2D Blu-ray/DVD movie to Blu-ray drive, launch the aPubsoft Blu-ray Ripper, and click “Load Disc” button to load Blu-ray or DVD from ROM. 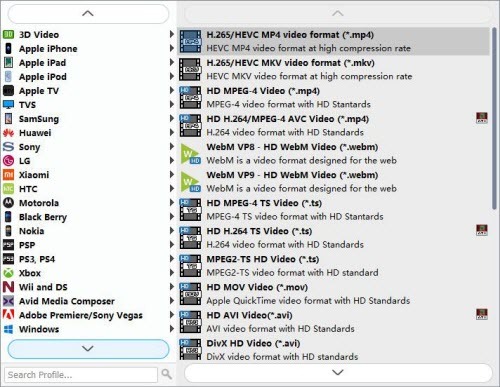 For video file, click the “Add video” button, browse to computer hard drive and import video into this app. Click “Profile” bar on the interface then navigate to “3D Video” category, and choose “MP4 Side-by-Side 3D Video (*.mp4)” as the output format. Tip: If necessary, you are allowed to adjust video and audio presets in Settings. Parameters like video codec, video bitrate, video frame rate, audio sample rate, audio channel, and more can be adjusted to achieve a better video/audio playback on Samsung Gear VR. An important issue that you must consider that in Samsung Gear VR, resolution for each eye is not Full HD but half the QHD screen. That is means a spilt VR resolution of 1280 x 1440 for each eye on Samsung Gear VR. It has a 60Hz refresh rate and a 96 degree field of view. Click “Convert” button to rip Blu-ray/DVD to 3D SBS MP4, convert video to 3D SBS MP4 video for Gear VR with original quality. After the BD/DVD/Video to 3D SBS MP4 conversion completed, you can click “Open Folder” button to get the generated 3D SBS .mp4 videos. Then transfer the created 3D movies to Galaxy Note 5, Galaxy S8/S7/S6 to watch 3D movie on Samsung Gear VR. Enjoy your 3D life! You may know about many popular safe torrent sites, such as The Pirate Bay, Kickass, etc., but may not know about YIFY. They are taking Blu-rays/DVDs and converting them to (on average) 1.5gb to 2.2gb .mkv or .mpr by using a popular x264 encoding software like Handbrake. This is whay they always maintain movie torrents with high quality and smaller file size. I have been downloading a few 3D movies from YTS (formerly YIFY) for many years now and have been very happy with the quality. Can I watch a 3D YIFY file on my Gear VR? I’m having a problem viewing 3D YIFY MKV. The users will encounter a lot of problems while trying to import 3D YIFY movies to Gear VR for playback, such as an Error message shows up that says “You are missing YIFY CODEC PACK to play this movie” or your YIFY movie videos will have black stripes over & below the scene. It is always suggested not to download any so-called “YIFY official codec pack”, because it may contain malicious spyware programs. To add source video to the 3D YIFY Video Converter, you can click “Add File” button to load the file you want to convert. Or directly drag and drop th YIFY files into the converter software window. From the “Profile” drop-down list, you are suggested to follow the path “3D Video > MP4 Side-by-Side 3D Video (*.mp4)” for converting 3D YIFY to 3D SBS MP4 video. Click on “Convert” button to convert 3D YIFY video to 3D SBS MP4 for Gear VR on Mac with best video and audio quality. After the 3D YIFY to 3D MP4 conversion finished, click “Open Foler” button to locate the 3D SBS .mp4 files. Then, setup your Gear VR and put the generated SBS 3D MP4 video files in the “MyVideos” folder miscroSD of VR Gear and start your theatric 3D experience at home! If you find your movie to be not in the right format, you can download?video converter program to convert your moviefile for Gear VR playback via S7/S7 Edge. I have personally used aPubsoft Video Converter, and am still amazed at how well it performs for a freemium program. In Addition: Apart from Galaxy S7, Samsung Gear VR also works on the following Samsung Galaxy smartphones: Galaxy Note 5, Galaxy S6/S6 Edge/S6 Edge. We aforementioned that we love to use aPubsoft Video Converter to convert unsupported video to 3D SBS MP4/MKV for Gear VR. Because it can convert any 4K/SD/HD video, TV shows and music dramas to 3D SBS video for Gear VR viewing on S7/S7 Edge. It offers three kinds of 3D effect: SBS, TB and Anaglyph and can switch 3D effect to another. It can transfer AC3/DTS audio to AAC/MP3 audio file accepted by Gear VR software without quality loss. Run this aPubsoft Video Converter as the best 3D Video Converter for Gear VR (Mac version)on your computer. Click the “Add File” button, browse to computer hard drive and import video into this app. Batch conversion feature allows you to import multiple source videos to converted to Gear VR. Click on “Profile” bar and find “3D Video”, there are a lot of format options for you. “MP4 Side-by-Side 3D Video (*.mp4)” is recommended for Samsung Gear VR.Or you can choose 3D SBS MKV for Gear VR playing with Galaxy S7/S7 Edge. 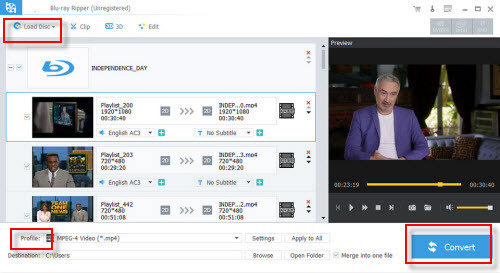 Tip: We recommend using 1280 x 720 HD resolution to encode your videos. Higher resolutions will not provide any better quality, meaning you’ll waste space and processing power. 3D movies should be encoded “full side-by-side” with a 1:1 pixel aspect ratio. Content mastered at 1920 x 1080 compressed side -by- side 3D should be resampled to 1920 x 540 resolution full side -by -side resolution. You can click “Settings” near the “Profile” to adjust the video resolution and bitrate to get more compatible format with Gear VR. Click “Convert” button to convert video to SBS 3D MP4 or 3D SBS MKV on Windows 10/8/7/XP. 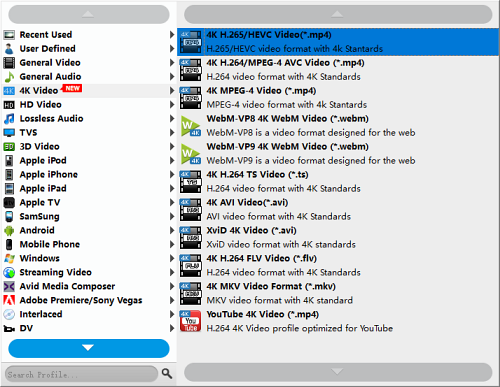 After the video to 3D MP4/MKV conversion finished, click “Open Foler” button to locate the 3D SBS .mp4 or .mkv files. Then, setup your Gear VR and put the generated SBS 3D MP4/MKV video files in the “MyVideos’ folder miscroSD of VR Gear and start your theatric 3D experience at home! Tip: If you’re planning to rip Blu-ray/DVD to VR on Windows 10/8/7 PC, you can get help from an all-in-one tool aPubsoft Blu-Ray/DVD Ripper.